After identifying my info addiction as a major stumbling block towards my success, I began to research addiction and how people with ADHD overcome it. 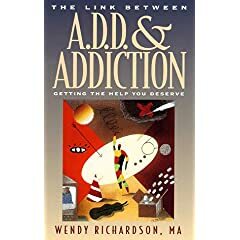 The first book I found was "The Link Between A.D.D and Addiction: Getting the Help You Deserve" by Wendy Richardson. With such a long and helpful sounding title I thought I had struck gold with my first strike. Alas, this is one claim that didn't pan out for me due to a serious philosophical difference between how the author and I approach ADHD. Right off the bat I should warn you. This book was written by a person with ADHD and it reads like it. The author often changes subjects within sections. She doesn't always finish the subject she starts at the beginning of the section, and, in my opinion, she transitions from premise to conclusion but often forgets the proofs. I should also warn you that the author spends the first eleven of fourteen chapters touching upon addiction by recounting the tragic tales of ruined lives she's come in contact with, but mostly she identifies what ADHD is. As with most self-help books on ADHD there is usually a laundry list of attributes that the ADHD reader can identify with. Shoplifting? Yep, I was once a stupid teen. Restless energy? It's 4:13am and I'm up blogging. A restless brain that entertains itself by deconstructing — taking "apart every sound, event, internal or external conversation, movie, piece of music, building, or story"? Boy, howdy. For example, my mother's convinced I don't like any movies. She doesn't understand that ripping them apart and poking at the innards is how I enjoy them. To be fair, the book was written for addicts who discover they have inadvertently been self-medicating their ADHD. Many have no idea what ADHD is or how it manifests itself, so a book like this may be helpful to them. This was my first problem with the book. I found little to grab onto and relate with. Info addiction was not covered as well, and I vehemently disagreed with Richardson on many key points. Her premise seemed to be that addiction is a side-effect of ADD. Join a 12 step program while medicating ADD and voilà! No more addiction! Almost all of her examples were people with untreated ADD. Magic pills saved their lives. There was no mention that people who are addicted might actually like the feeling of intoxication — that they crave the experience. Addiction is often not about self-medicating, it is about the rush. Treating their ADHD won't replace those cravings. There is also the dubious solution of treating people addicted to psychostimulants with more psychostimulants. Overall, I found the book disappointing. There was far too much faith placed in the power of professional ADHD treatment through meds. I found it almost niave. However, given the fact that the author believes that ADHD people are genetically loaded for clusters of problems, that they can't will their predisposition for addiction away, and that they can't change their genetic makeup, it is not surprising to me that she feels that taking responsibility is done by seeking treatment, and that being on psychmeds helps one "let go of the moral judgements, criticisms, and shame." (see page 62) The message seems to be "You can't help yourself. Let us medicate you. It's your only hope." I couldn't disagree with this premise more. There was no solution for anybody who couldn't take ADHD medications. Some people suffer greatly from the side-effects. Some people can't afford expensive psychotherapy and pharmaceuticals. Some people don't want to be told they can't help themselves and that "being responsible" is putting their life in the hands of a licensed professional. This was a great shortcoming in the book's approach to ADHD and addiction. Why you should read this book: If you've recently discovered you have ADHD because of your addictive behavior, and you need to have ADHD explained to you, then this book may prove to be helpful. There is a very cathartic feeling to read of others' lives and how ADHD affected them for the good and the bad. You may find solace in the pages of this book because you will find example after example showing you that you are not alone. Why you shouldn't read this book: If you already know you have ADHD, then the first eleven chapters will be mostly redundant for you. I'll save you some time. 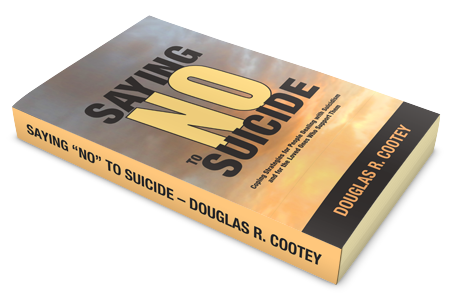 Here is the book's message: Your addiction is a symptom of untreated ADHD so you should go see a doctor, get meds even if you are a stimulant addict, and then your addiction will go away through therapy and attending a local 12 Step program. Don't relapse. That's bad for you. If this doesn't fit into your life experience, then the book won't be very helpful to you. AD/HD Friendly? Maybe. I found the book to be a mess — like a patchwork quilt of thoughts and conclusions — but you may enjoy peeking into another ADHD mind. Personally, however, I didn't find the writing style enjoyable. It seemed ADHD hostile to me and difficult to follow.